Come sing, dance, laugh and learn with your little one! Musical Beginnings is a unique multi-age class (0-3 years) that uses percussive instruments, movement, songs and rhymes to give your child a solid musical foundation. Watch your child develop a love of music and an understanding of musical language. Q: At what age can my child start Musical Beginnings? A: As early as 6 months old! If your baby is younger than 6 months, you and your baby are welcome to attend our classes for free upon registration. Q: What makes Musical Beginnings a unique music class for infants and toddlers? The Musical Beginnings curriculum uses the same songs and rhymes throughout the entire course. Children of this age love repetition and we've found that by layering new types of musical activities into familiar tunes and rhymes, children progress effortlessly. All Musical Beginnings classes are mixed ages. This is based on the Suzuki principle that children learn best from other children. Young infants learn not from the teacher, but from imitating the older children. Older children and toddlers practice fine motor control and focus because they need to control themselves and move carefully around infants. Q: When and where are Musical Beginnings classes offered? 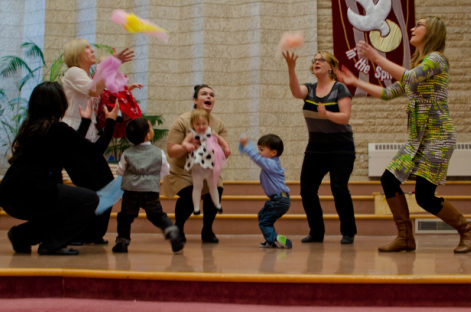 A: Musical Beginnings classes take place on Wednesday mornings (9:30-10:15) and Thursday evenings (5:45-6:30) at Herzlia-Adas Yeshurun Synagogue (620 Brock Street) in the River Heights area of Winnipeg. Q: How do I know if my child should participate in Musical Beginnings or start learning an instrument (ex. 2-3 year old)? A: This class works well for your 2-3 year old who loves music so much he/she has a hard time keeping still! Musical Beginnings allows your energetic child the opportunity to develop a musical foundation while learning the fine motor skills and focus necessary for formal private and instrument-based music lessons. Q: What are the expectations for parental involvement in Musical Beginnings? A: Parents are expected to join in! Yes, that means singing along, dancing along and playing the instruments too! Not to worry, most of the nursery rhymes used are very familiar. With regular listening of the home listening recording "My First Songs and Rhymes," you will quickly learn all of the words and melodies. We recommend a ratio of one guardian per child in the class. Q: Is there any practice/preparation required at home? A: There is no home practice required, but we recommend listening to the recording as often as possible. Singing along with the recording in the car is a great place to start! Q: Does the Musical Beginnings Class participate in any concerts? A: No, but Musical Beginnings families are more than welcome to attend Suzuki concerts. Q: How do I register my child for Musical Beginnings and what is the cost? A: View registration details on our Register page. You can register by completing the Musical Beginnings Online Registration Form. Q: If I have other questions, who can I contact?